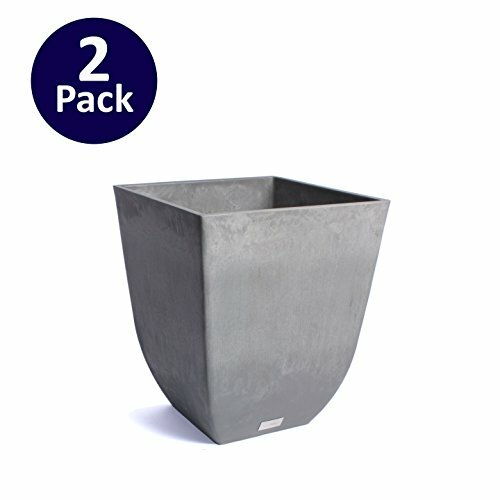 Veradek Sierra Square Planter - 2 Pack (Charcoal) by Veradek at Tulips Orchids. Hurry! Limited time offer. Offer valid only while supplies last. Contemporary with a traditional feel, the Sierra design is the perfect piece to refresh an empty corner or anchor small or large plants alike. Contemporary with a traditional feel, the Sierra design is the perfect piece to refresh an empty corner or anchor small or large plants alike. Featuring a subtle marbled finish and a sleek, contemporary tapered design, the Sierra planter is the perfect piece to complete the look of a front entrance or line the perimeter of a pool. Molded from a patented plastic composite, all Veradek planters are extremely durable and designed to withstand the elements - winter or summer. Sierra planters are flexible, impact resistant, sturdy yet lightweight and specifically treated with UV inhibitors to minimize fading. With a Veradek product you can rest assured that you are receiving the perfect balance of design, convenience and durability.